My brother was in Bangalore last week to deliver all the Diwali goodies - Mum's special preparation of sweets. His plans weren't fixed early enough to get some bookings done for the weekend. I kept checking the JLR site almost every day and surprisingly a room showed available at Bandipur, perhaps because of some cancellation. So off we went to the jungle on Saturday, his first ever experience in the wild. Almost an hour into the safari, there were the usual suspects that showed up as always barring the elephants who remained elusive in this trip. Then we hear some alarm calls and anxiety starts building up. One of the jeeps had gotten a glimpse of a tigress walking on the trail inside the thicket and were waiting on the other side of the road for her to cross. So we joined them too and parked the car by the road maintaining perfect silence. The alarm calls grew closer and now we could even hear some hustle bustle in the thicket on our right. We patiently waited there with hopes of seeing the stripes, and she obliged! 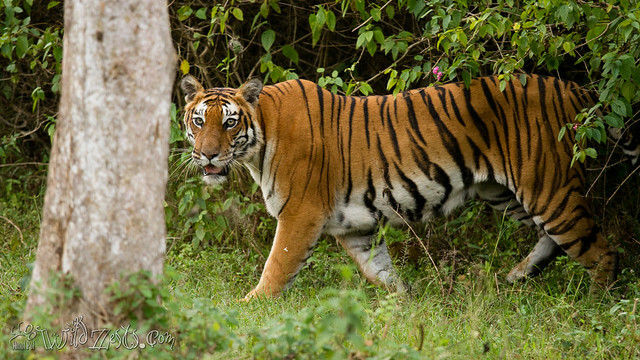 Out came a tigress known by the name "Gowri" and crossed the road in front of our jeep. She's one of the two females who've been raising a litter in the tourism zone at Bandipur. She's got 4 cubs who would be soon be turning 18 months and will be ready for claiming their own territory. Hopefully, they'll all be successful hunters too and help in adding a few more to their clan. The sighting was less than a minute, but it made my day! Here's a shot that I could get with some reasonable eye contact with her.